The following is a summary of remarks made by Davis Fox [Policy Analyst and Project Manager who works with Kathie Gannon, DeKalb County Commissioner for Superdistrict 6] at the MANA Neighborhood Association Community Meeting – June 17, 2013. Bolded items indicate questions from the audience, followed by Mr. Fox's answer. the legislature would not allow them to incorporate because its local delegation refused to support this cityhood plan. When the state legislature swung to a Republican majority, the law was changed (to allow legislators outside the delegation to vote on a cityhood plan) and other cities soon followed (Johns Creek, Milton, Dunwoody, Brookhaven). To clarify, incorporation means to form a city within a county. City of Decatur is an example of a city within the County. Unincorporated means any land within the county that is not within a city’s boundary. The Medlock area is an example of unincorporated DeKalb. Before a city can be formed, a financial viability study must be completed. Simply including homes is not enough; commercial and industrial properties pay significantly more than residences. City proponents will draw boundaries that include as much commercial/industrial area as possible and this creates a “panic effect” as the rest of the unincorporated areas fear there will be no tax base to support them. For example, the City of Briarcliff organizers felt pressure when the City of Lakeside proposed to “grab” the Toco Hill commercial area. The City of Lakeside proposes to incorporate most of the Lakeside school district. The City of Briarcliff is a larger area and includes most of the Lakeside proposal. The financial viability of both proposals is unknown until studies are completed. Fulton County’s new city proposals were deemed financially viable and the cities did ok during the recession in particular because they did not have legacy pensions systems (this was a large burden for older cities whose pension funds decreased dramatically during the economic downturn). Another reason is that these newer cities have fewer employees and outsource a lot of services. The process to form a new city is as follows: if proposal is made and found to be financially feasible, a charter is approved by the General Assembly. This charter then goes to a referendum for those residing within the proposed city. If the referendum is passed by the affected voters, the Governor then appoints a commission to organize the city, and an election is held to choose a mayor and commissioners. This all can happen fairly quickly, and elections could be held next fall (2014). How would the overlapping proposals be handled? The Carl Vinson Institute at UGA focuses on doing feasibility studies, it offers no answers about services or boundaries. It could be that both the Lakeside and Briarcliff proposals are found to be viable. This would pose a legislative conundrum; a decision must be made, and studies may need to be revisited unless a compromise is reached. School impact? It’s unlikely there would be much impact on public schools because the school board is separate. Remember that around 2/3 of your property tax is directly allocated to the public school system. City of Atlanta and City of Decatur both have their own school systems. In the case of annexation, those residents would be incorporated into a city, and instead of their taxes supporting county public schools, they would support the city’s school system [it may be possible for children to continue to be part of a county school system. This occurred in Gainesville and Hall County]. City of Decatur’s schools are expensive and they need to limit the number of children and incorporate only commercial/industrial property. The legislature has left the issue of education to the counties and no new school systems can be established without a constitutional amendment. In very rural areas, the formation of new municipal school systems could leave outlying areas without the resources to fund public schools. It’s unlikely that cities will be able to create their own school system anytime soon. Is it true that city residents pay for services twice? No. Their taxes go towards the services they provide. Cities may contract with the county for services, e.g. parks, police, etc. There are some hidden costs and a city may pay for some county services; for example, a county will do an annual financial audit, and some support services may be duplicated somewhat (e.g. information technology, legal). The county can proportionally scale down [for services taken up by a new city], but it is more difficult at least initially to scale back support services. 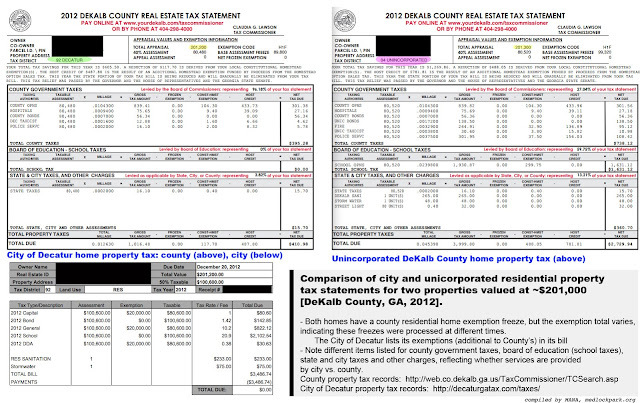 What happens to those taxes if City of Decatur annexes Suburban Plaza? Look at your property tax assessment. You will see sections such as County, Bonds, Police, HOST Credit, Homestead Exemption and a % indicating the millage rate that is being calculated against 40% of your property value. Only 2 or 3 items will change position when a property becomes incorporated. Services that the City assumes will not be paid by the County and those taxes go to the City. To illustrate Mr. Fox's comment, the above compares city vs unincorporated residential property tax based on a $201,000 property. Click to enlarge. Another thing to remember is office buildings are very desirable and valuable because of business license fees. These are based on the number of employees. So, in addition to the franchise fees mentioned earlier, those license fees would also go to the City of Decatur. It was a big hit for the County to lose Dunwoody. Have Lakeside and Druid Hills (proposals) picked services? Not sure but think that Lakeside has picked planning (zoning, permits), police and parks. Briarcliff picked the same as well as roads and drainage. Regarding the Lakeside/Briarcliff proposal overlap, if one proposal is feasible, will the other one have to pay another $30,000 to re-do its study? Not sure, but the Vinson Institute is part of UGA, UGA is a state school, so hopefully they would adjust the study without gouging. So, the feasibility study is about money, not a zero-sum game? No interest in the impact in surrounding areas? Yes, the study is about the study area, there is no analysis on impact on unincorporated areas. Follow-up question: Isn’t that irresponsible? Concern for the unincorporated areas is not what drove the policy and law regarding how cities are formed. Q: If we work towards improving Medline and there is reinvestment won’t Decatur step in and annex it? The methods of annexation are limited. DeKalb delegation could approve the Suburban Plaza annexation but they also represent the rest of DeKalb Co. so hopefully they would refuse. Another way is for property owners to ask to be annexed. Given that Selig has a long-running feud with City of Decatur, that is unlikely. Q: What is the timing on all this? If both groups get their $30K, the study can be done in a 6 month period. The legislative session begins in January could review each proposal if there is a sponsor for each city. If the proposed cities had non-overlapping boundaries, both could go forward and there could be 2 referendums. Brookhaven was approved in the 2012 legislative session, held elections in 2012 and had a council in place by 2013. Basically there are three options: support a new city, support annexation into an existing city, or stay and improve the county. Q: What does it mean for us if Lakeside proposal goes through? You would not be able to vote on Lakeside (you are outside its boundaries), You would only vote on a Briarcliff proposal. Q: Could overlapping boundaries be hashed out? Unknown! Ideally, the two organizations would work together. Q: Could the government put a stop on all this hanky-panky? Could there be a lawsuit? Unknown. This is a snowball effect, it’s hard to stop.